Traffic: closed to through traffic; detour posted. Local traffic will be maintained for home and business access only. 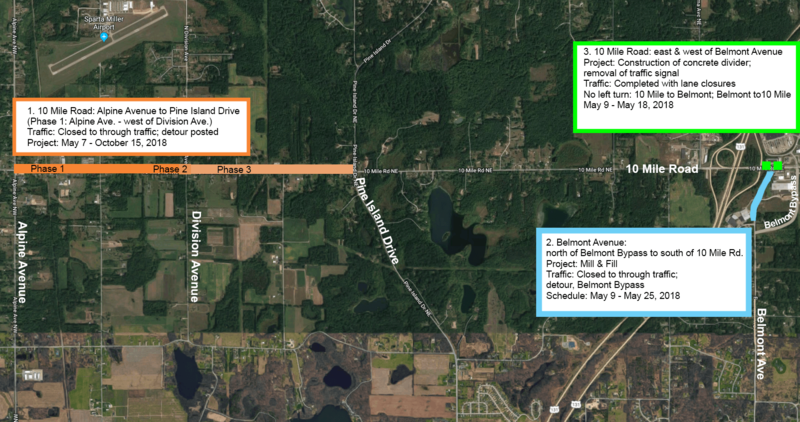 Phase 1 - Alpine to just West of Division: Work began on May 7th; this portion of 10 Mile is currently closed to through traffic. Phase 2 - Division Avenue Intersection: The intersection will be closed for a projected 14 days. Advance notice will be provided of intersection closure. Traffic: Lane closures. No left turn from 10 Mile Road to Belmont Avenue, Belmont to 10 Mile Road; left turns may be made from, and onto, Belmont Bypass. About: The existing traffic signal at 10 Mile Road and Belmont Avenue will be removed and a concrete median divider will be constructed on 10 Mile Road to deter left-hand turns onto Belmont Avenue. Those seeking to make a left-hand turn from 10 Mile Road should now use the newly completed Belmont Bypass. 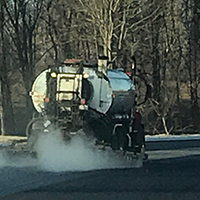 About: Mill & Fill is a structural pavement treatment that involves the removal of the existing surface layer with a milling machine and the replacement of the milled location with new asphalt. This process is used when a surface has deteriorated to poor condition and surrounding grades (i.e. curbs, driveways) must be met.